Goodday ladies, another Monday has rolled around and I thought it was about time I showed you how I made my double layered folding curtains (otherwise known as roman blinds). Because basically that is what I have done. I have created two layers of folding blinds. And the big trick is that both sets of blinds are mounted on the same hardware. This project was a long time in the making. In fact I started thinking about it already during the first winter in our house (now nine years ago). I had gone for the beauty factor when we moved in (in the summer) and bought floor length curtains that covered the whole wall including the bay window. When closed they also covered the main radiator…. And in winter it gets cold, and one needs heat, and the heat got trapped behind the curtains. So we started to leave the curtains open in the middle to let the warm air out. It made vegging on the couch Al Bundy style, a bit hard to do, because open curtains at night means people looking in. So the wheels started turning right away, how could I fix this, preferably in a eye-pleasing way. First I definitely wanted to keep the sheer roman blinds we had now, they provide excellent daytime privacy and look great. Second the budget was limited. Three both the man and I had to like the outcome. So I considered several options and had to dismiss them all. I did NOT want curtains that would rest on the window sill. stay in style of our original thirties-looking bay window. would sit too deep and they would not be able to open up. Oh and they would have to be custom made and would cost a fortune. and the man didn’t like it (and me neither truth be told). our window frames are angled and become narrower. which would look really odd. So now you understand why this took me so long. And believe me I searched high and low for a ready made solution. And when I decided that I needed to have two folding shades over each other I was convinced there would be hardware to match that idea. When I went to several specialty shops and window covering experts they all looked at me as if I had gone bonkers. It just did not exist. No other solution, I had to make them myself….. Here is how I made my double layered roman blinds. I forgot to photograph some details, so I apologize in advance, but heck what are the odds that you are faced with exactly the same challenge anyway…. I began by pinning the existing sheer roman blinds, while they were still hanging, at the height I wanted to keep them, . Then I replaced the drawing cord (the original one stayed in the hardware) and secured that to the top at the proper length. This layer would stay fixed at this length now, which was okay because I never lowered it anyway, only to take them down for washing and I would still be able to do that. I stitched the cord to the top while I also stitched a new strip of Velcro to the front of the panel (you see the back here that already had Velcro). I stuck the rough side of the Velcro on the back of my existing hardware (sorry no pics). That only just worked out, because the back wasn’t a nicely straight side like the front. I fully expect to have to apply some extra glue to this Velcro from time to time. But so far it is holding up great. Now the hardware was free to be used for the top layer. 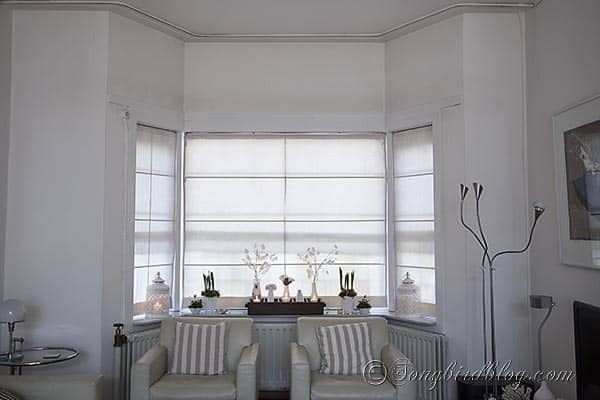 I used the original measurements I had for the sheer blinds and sewed three new panels out of the existing curtains. The top got some Velcro on the back to adhere to the hardware. I sewed ‘strips’ to the back that I could slide the rods into and guide the pull-up cord through. I must say I was lucky to have a fabric with a pattern that gave me a straight line. That way I could make sure that my ‘strips’ were straight and that the pattern would run through on all three blinds. And then I hang them! And they look great. We have to open and close them with a bit extra attention but we are very pleased with the outcome. When I came up with the plan I was planning to add faux curtains to the side to warm it all up. But we are starting to really like the open feel the windows have without the curtains on the side. The room looks a lit lighter and bigger and spacier. So most probably we will not by hanging new curtains but instead hang sconces or art work on the free walls. So remember my January plan for this part of my living room? Only the radiator cover did not get done yet. But we need it now more than ever, so we are working up the courage to tackle that. That is after we tackle all the new challenges that were left after I had finished my curtain project. There is some leftover business to take care off now that the curtains are gone and the walls are so much more obvious. We didn’t notice before how dirty the wall had gotten again. And that stupid electrical outlet a previous owner put in that ridiculous spot is a true eye-sore now. And it all is a bit bare even for our taste. But for now I am very pleased to cross this of my list. And my Love is very pleased too, in fact he bought me flowers just to say thanks for fixing the curtain situation. I guess he is happy to be ‘doing the Al Bundy’ too 😉 . Wat een werk, maar zeker de moeite waard! Ik kan ook niet geloven dat je in de winkels niets geschikt vond. Het resultaat mag er wel zijn, ik vind de avond-look heel mooi. En tja, klein beetje kaal nu, maar dat komt ook weer in orde natuurlijk! Leuk dat je nu kan Al Bundy-en ;-). This is gorgeous!!! Thank you for sharing. Can you please tell me where you got that fabulous sectioned “tray”? I have been searching for one. Dat ziet er goed uit! Petje af! What a great solution to your problem. Your living room looks like a lovely place to relax – Al Bundy style, if you like. Sometimes, you have to come up with answers on your own, and you did! Congratulations. Love this solution to the problem. …because, your smart and savvy like that! Wonderful creation! Can I send you my window dimensions and have you make some for me too? 😉 I would love to have Roman shades in my bathroom but don’t like that there’s no in between to open or closed. So glad you linked up with TDC so that I could pop over and see your wonderful idea and be introduced to your blog. Beautiful – really clear instructions. Where did you get the wooden box on your window sill? Its gorgeous! The box is an old brick maker box that I found in my father-in-law’s basement. Hi there! This is EXACTLY what I need to do, I want sheer curtains for daytime privacy and a solid fabric to block out the light at night but the thing is I’m starting from scratch! 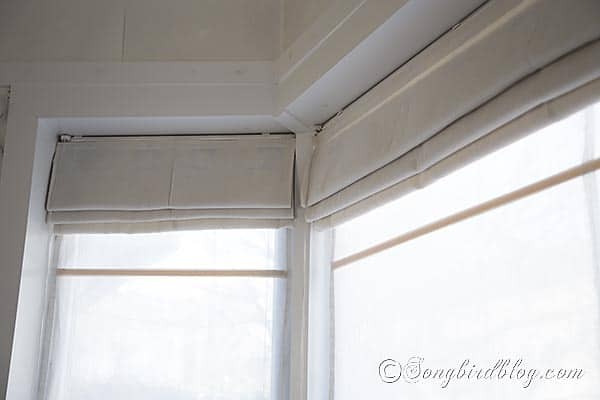 I just want to make sure I understand.. lets say you already had the sheer curtain at the correct length, are you just adding the additional curtain onto the hardware with the velcro and then the two curtains essential open and close separately but just attached to the same top rod?